Each year anywhere between five and 50 whales, dolphins and porpoises are washed up on Britain's beaches. British Divers Marine Life Rescue, a volunteer charity, was set up in 1998 to rescue them. 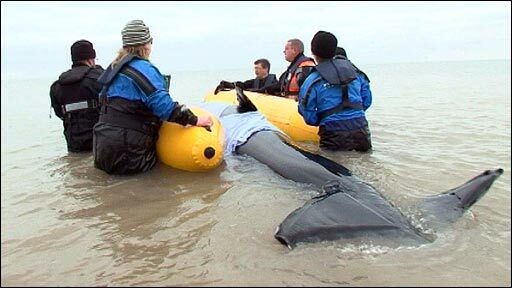 To find out how it's done Nick Higham, and volunteers including a chef, a plumber, a man who runs boat trips and a woman who works in IT, encountered a two-tonne inflatable whale for a training course on a Kent beach. Talking him through the process were the charity's chief executive, Mark Stephens, and vet Iain Cope. If you spot a stranded whale, dolphin, porpoise, marine turtle or basking shark on the UK coast, the UK Cetacean Strandings Investigation Programme would like you to contact them.